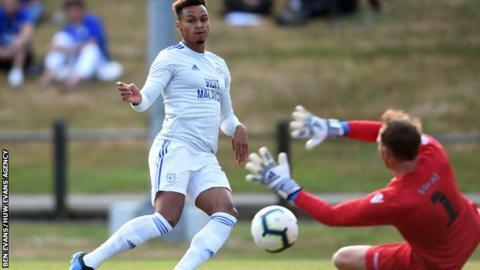 Danny Ward and Kadeem Harris scored hat-tricks as Cardiff City swept aside Bodmin Town 11-1 in a pre-season friendly at Priory Park. Cardiff led 7-1 by half-time and showed little mercy after the interval despite manager Neil Warnock making changes. Winger Harris earned three penalties against the South West Peninsula League outfit, scoring two of them. After the break he allowed Ward the honour, for the striker to claim his hat-trick from the spot. Former Bristol City striker Bobby Reid opened the scoring, before Nathaniel Mendez-Laing extended the lead, with Cardiff too quick and powerful for their opponents. Josh Murphy, signed from Norwich City earlier this summer, added a brace to net his first goals in a Cardiff City shirt. Gary Madine headed home the 11th in the dying seconds. The Bodmin consolation was scored by Max Gilbert against debutant goalkeeper Alex Smithies in the first half.